The Sunbounce system consists of a collapsible aluminum frame that can be easily assembled and combined with different reflecting, light-reducing, or light-absorbing screens to take full advantage of any kind of light--hard or soft, natural or artificial. 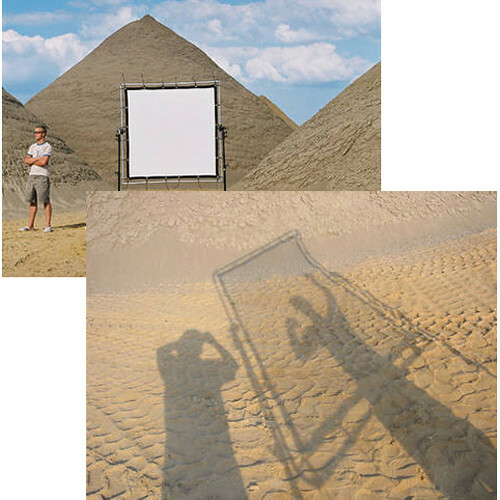 This Sun-Scrim Translucent 1/5 Butterfly Kit (6x6') from Sunbounce includes the lightweight, stable, anodized aluminum 6x6' frame and a 6x6' translucent 1/5 screen. The translucent 1/5 screen transmits a great deal of light, while diffusing and softening it slightly. Bungee "snakes" required to fasten the screen to the frame are not included. Stands not included. Box Dimensions (LxWxH) 45.0 x 8.0 x 5.0"